What is a user portal? A user portal is a way for a customer to login to their account with a company, typically through a web browser. User portals are built using user portal software and are a great way for companies to provide customers with the ability to independently view and manage their accounts and related content without having to actually rely the company for direct support. 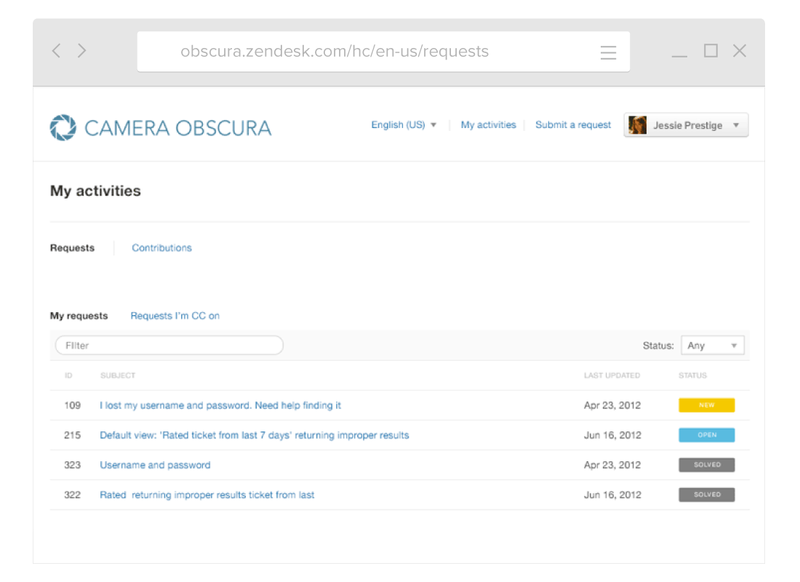 Zendesk puts the power into the customer’s hands by giving you the ability to provide them with their own user portal. Long waits. Due to high volumes of service requests, customers would have long waits—either for responses to email or hold time on the phone—for even simple questions. No control. If a customer wanted to make a small change, such as updating contact phone number or shipping zip code on their account, they had to rely on the company to create it for them. Limited to business hours. Since customers were reliant on the company’s support agents, service could only be provided during business hours, something especially inconvenient for customers in other time zones. Perhaps most frustrating, without a user portal, customers must contact a company even when they don’t have a problem. If they simply want access to information about their account, they still need to call or email. Travel and hospitality: Customers can log in to their account through a user portal and check the status of a reservation or make simple changes to them. B2B: Customers can learn the status of open tickets, look up the answers to questions about billing, and make changes to user settings. Retail: Shoppers can check or even make changes to billing or shipping preferences, learn the status of a shipment, or learn about return policies. User portal software can often accommodate the above benefits and much more. Since many customers prefer self-service options, and they decrease the costs of high volumes of service requests made to the company, every business with an online presence should offer their customers a user portal. Zendesk puts the power into the customer’s hands by giving you the ability to provide every user with their own user portal. Not only does it make it possible for them to access their own accounts anytime they want, it also means they’ll have access to all of the great self-service options Zendesk offers in Help Center, from a knowledge base to an online community for all customers.